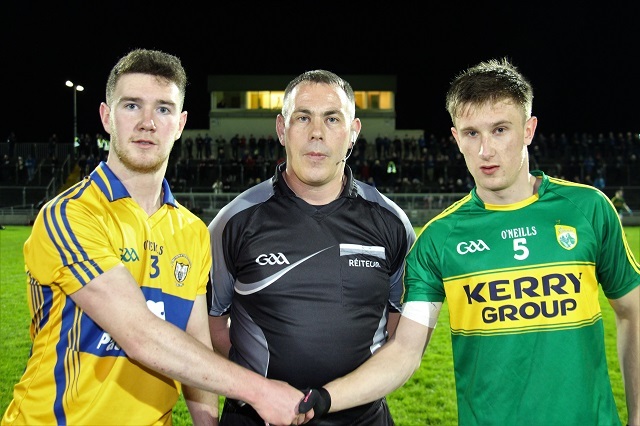 Kerry eased their way into the Munster Under 21 Qtr Final at Austin Stack Park this evening but only after a tough examination of the capabilities from a Clare side who were well in contention for three quarters of the game. Kerry started brightly and were five points to one ahead within the first 12 minutes all of which were from play with Sean O’Shea contributing two of those scores. Kerry seemed to take the foot off the pedal then and Clare came within inches of gaoling when Conor Finucane fired just over the bar after Aidan Davidson had scored their second of the evening. Tom O’Sullivan and Sean O’Shea (free) extended Kerry’s lead to four points but then Conall Ó hAinifean soloed clean through the Kerry defence to plant the ball past Shane Ryan in the 23rd minute. Kerry’s response was immediate however when, after Matthew Flaherty pointed, Matthew O’Sullivan came in on the end of a lovely passing move to crash the ball to the net. At the break it was 1-8 to 1-5 for the home side. Kerry started the second half with three wides before Sean O’Shea and impressive sub Killian Spillane pointed but then Eimhin Courtney got in behind the Kerry defence and finished calmly to leave just a point between the sides at the 40th minute, 1-10 to 2-6. That was as good as it got for Clare however as Kerry responded impressively with a string of points from the likes of Killian Spillane, Matthew Flaherty, Cathal Bambury and Conor Geaney and there was no way back for the Claremen. Kerry will now play Waterford on Wednesday next in Dungarvan at 7:30pm in the semi final. Meanwhile, in the other Qtr Final, Limerick caused a shock when defeating Tipperary by 0-16 to 0-14 after extra time and now play Cork in the semi final in Páirc Uí Rinn on Wednesday evening. C Finucane (0-5, 0-4 frees); C Ó hAiniféin (1-1); É Courtney (1-0); K Sexton (0-1 free), A Davidson (0-1 each). Shane Ryan (Rathmore); Tom L O’Sullivan (Dingle), Jason Foley (Ballydonoghue), Tom O’Sullivan (Dingle); Brian Sugrue (Renard), Andrew Barry (Na Gaeil), Daniel O’Brien (Glenflesk); Barry O’Sullivan (Dingle), Brian Ó Seanacháin (Ballydonoghue); Brandon Barrett (Ardfert), Sean O’Shea (Kenmare), Matthew Flaherty (Dingle); Cathal Bambury (Dingle), Matthew O’Sullivan (St Michael’s Foilmore), Conor Geaney (Dingle). Subs: Killian Spillane (Templenoe) for M O’Sullivan (34); Jack Morgan (Austin Stacks) for O’Brien (41); Ciaran Coffey (Kerins O’Rahillys) for Sugrue (53); Lee O’Donoghue (Glenflesk) for Geaney (54); Rob Ó Sé (An Ghaeltacht) for O’Sullivan, Ivan Parker (Churchill) for Bambury (both 58). K Roche (Cooralcare); E O’Connor (Éire Óg Ennis), D Nagle (Liscannor), C Payne (Killimor); C Ó hAiniféin (Ruan), R McMahon (Kildysart), C Brennan (Clondegad); D Bohannon (Shannon Gaels), C O’Dea (Kilfenora); A Davidson (St Breckan’s), A Sweeney (St Breckan’s), D Egan (Kilmihil); C Finucane (Lissycasey), K Sexton (Kilmurry/Ibrickane), E Courtney (Éire Óg Ennis). Subs: R Danagher (St Breckan’s) for O’Connor (HT); O Hanrahan (Lissycasey) for Egan (36); J Culligan (Ballyvaughan) for Payne (40); S O’Donoghue (Cooraclare) for Bohannon (42); C Downes (O’Curry’s) for Sweeney (50); D Foran (Killimor) for Davidson (52).